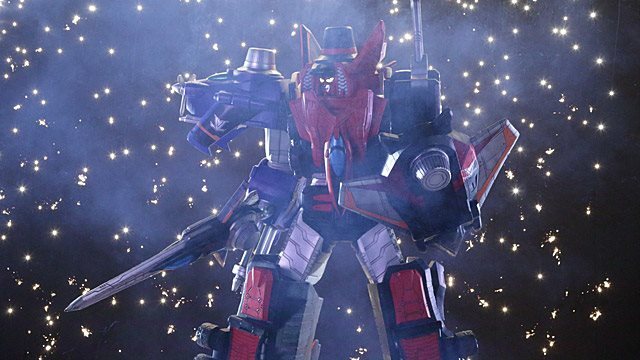 Here are the clips for the 10th episode of Kaito Sentai Lupinranger VS Keisatsu Sentai Patranger. In this episode, Kairi finally activates the newest Lupin Collection's hidden functions! "The new Phantom Thief combination!" After 10 episodes, I already consider this a vast improvement over Kyuranger. In fact, I think its several steps up compared to the past six years, which have been rather shaky for super sentai. From the writing, directing, drama, tone, and characters, its immensely cathartic to finally be able to thoroughly enjoy a currently airing sentai as of now. The episode itself was great, watching how each of the lupinrangers react differently to a piece of the lupin collection supposedly being destroyed. Kairi is furious as he takes out his frustration on a nearly catatonic Touma, who is too broken to even react. Umika, while clearly saddened still believes there is another way as she revisits the scene to see if there are any pieces left. I especially like how Touma, who is usually nowhere nearly as emotional as his two teammates snaps himself out of his funk by piecing together the available clues. Its a good contrast to Umika's optimism and perseverance, as well as Kairi's fly by your seat hunch that he could fix the problem by taking out Zamigo, which helps further establish him as the mostly cool-collected smart guy who relies on his head despite his lack of focus. The action set pieces were also pretty inventive this episode, with blue and yellow needing to grab the lupin collection of a monster who can create copies of himself before the patarangers can kill him and Kairi fighting Zamigo, who can kill him with one shot. The former is resolved with Touma tying up the monster so he can't escape via clone, while Umika has to retrieve it before the Patrangers finish off the monster. Kairi has a one on one shoot out with Zamigo, in which the latter proves why the lupinrangers and Gangler should fear him. Zamigo's confrontation with Kairi starts with him shooting off the latter's hat before he can fire a shot just to warn him he could kill him at any time, but would rather mess with him. The way he fights is undeniably (no pun intended) cool, as he conjures guns from his safes as if they were holsters, and shoots just as fast as he produces them. He's basically channeling Reaper from Overwatch, and even though I've never played the game, I know that he is the grim reaper looking guy who tosses the guns he uses. If there is any complaint I have, its that Kairi has yet to lose a fight or put in a situation where he screws up in a crucial way. Umika doesn't call him out for going after Zamigo and his fight with the guy is unfinished. I know its implied Zamigo wasn't being serious and might've won had he went all out but still. That being said, I still like him better then the past six reds. Also, I should mention the scene where the Lupinrangers do the same vow they did when they first met, yet this time Umika mentions they all have the same goal, Kairi and Touma silently look at one another which not only confirms their comradery, but also possibly a new dynamic that may have them help each other out. Lastly, I like the scene where the Lupinrangers don't inform Kogure of Zamigo, opening up more internal conflicts to an already shaky partnership. Couldn't the monster's clones have just surrounded him? The form of the shield and LupinKaiser's design really reminded me of Great Five in this episode. This show has been great so far. Hope they'll keep at it.